There’s a “what I looked like 10 years ago vs what I look like now” challenge going on all over social media right now, and it got me thinking about how my guitar collection has changed over that time period. 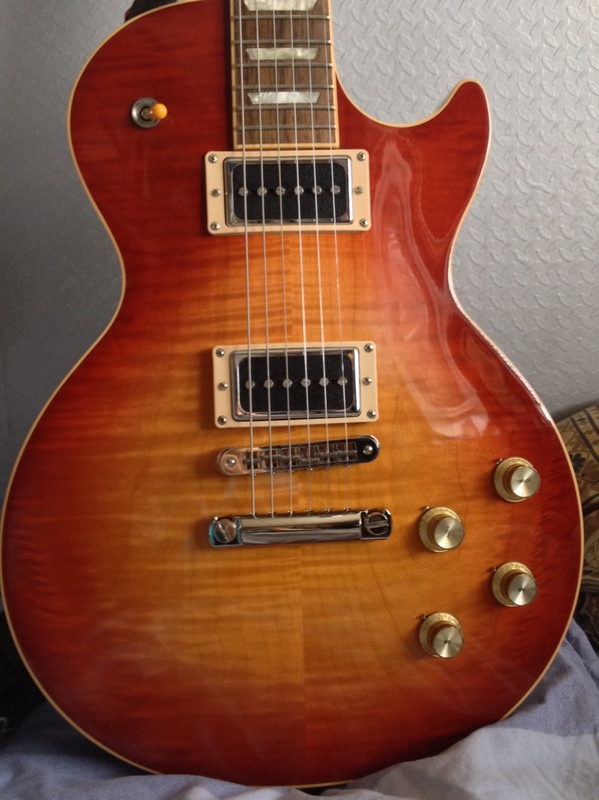 As much as you can remember (please nick a photo off Google Images if you don’t have actual photos to hand ) please post a pic of your MAIN guitar 10 years ago and your MAIN guitar today. I realise that for some of us picking a main guitar can be a challenge in itself but hey, DEM’S DA RULES! Here’s mine 2009: a Yamaha Pacifica 112 modded to death 2019: a top spec heavy relic Strat partscaster put together and finished by Raygun Relics that I absolutely adore. Let's make it the 10x2 challenge..
20 years ago: A peavey raptor special. You wouldn't say but what a piece of junk..
mim fat strat. Enjoyed this guitar immensely. Was a bit thin and dark sounding. 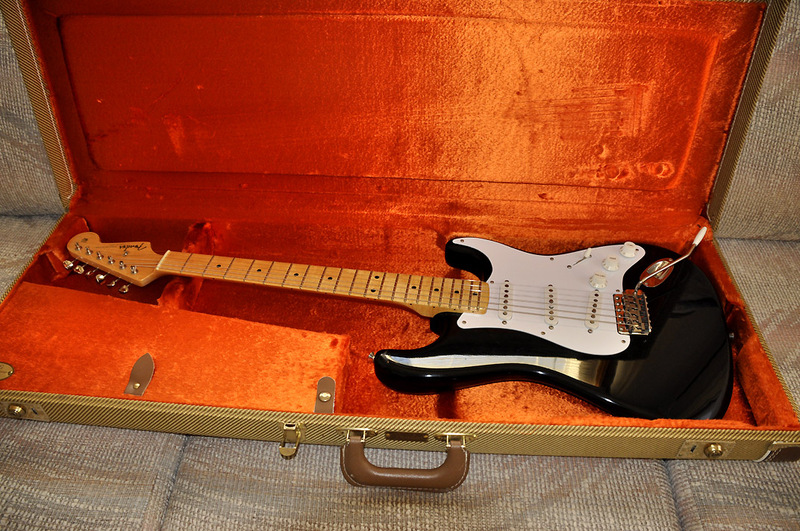 the reissue strat.. I see a theme..
10 years ago guitar (not a 10-year-old picture): Morgan Monroe Tempest. If you are into bluegrass, you probably know the company -- they're well known for mandolins and acoustics. In the first few years of the aughts, they made these PRS-inspired, Korean-made guitars. 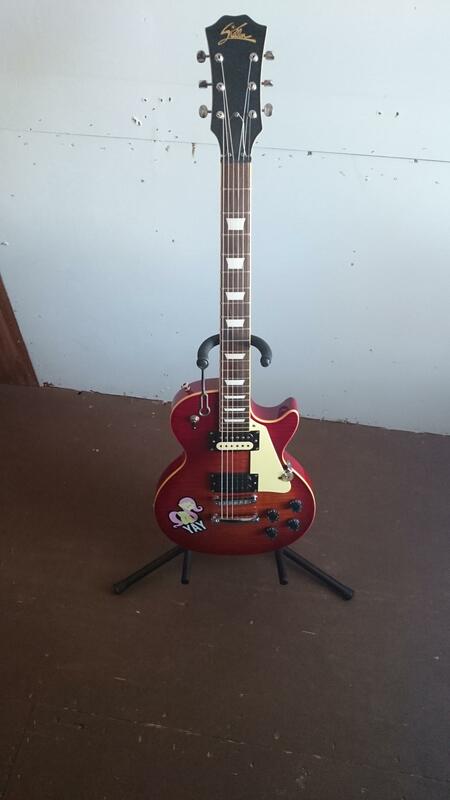 It was around $500 when I bought it in 2003, so similar to PRS SE money. Anyway, the story goes that they got a cease and desists from PRS and they chose to comply. It's a good guitar that plays very well. 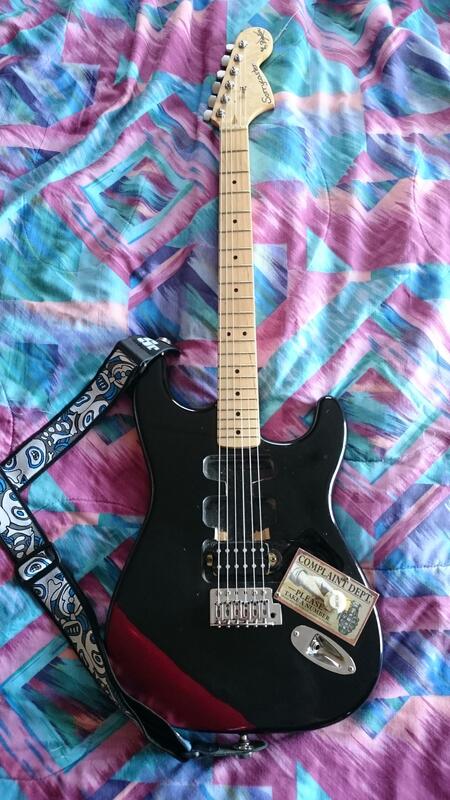 I put the Seymour Duncan Hotrodded Humbucker set in a few years back. My son has this guitar now, and, in a similar fashion to what his father did most of his life, is studiously ignoring it. Present-day guitar: This is and Eastman SB-59/v. It has a French polish varnish finish; what they call their "violin" finish. It's super thin and aged so it really feels like a vintage instrument. 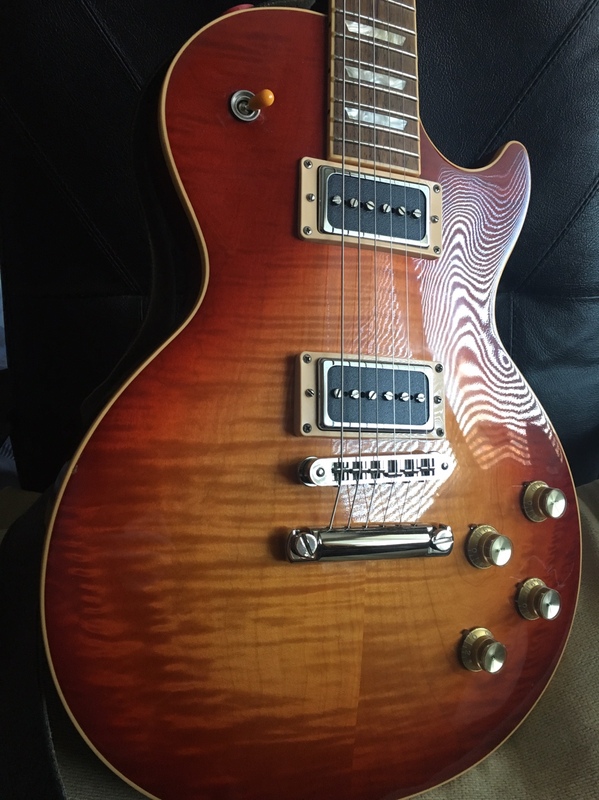 It has a better build quality than most Gibsons I've played (which is pretty much why I got rid of my Gibbos) and sounds amazing. I ain't playing by those rules! I've had my USA PRS for nearly ten years so would just post two images of that..... So I'll do the whole lot!!! SUCH A REBEL!! 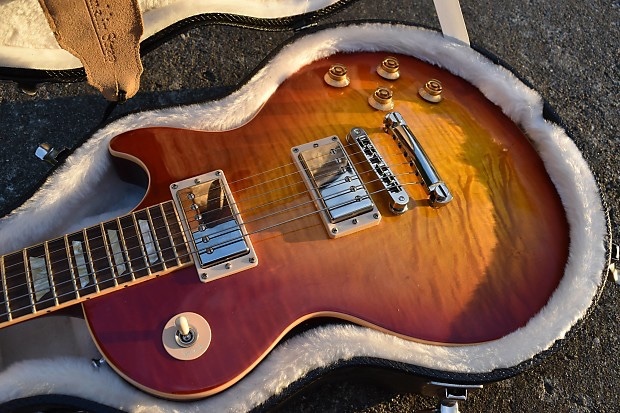 In 2009, I had this Gibson LP Studio and definitely the Bugera 333xl although I might have turned it into a head later. The Kawai was black and in terrible condition and I may or may not have had the G&L/Variax by that point. Definitely had the Jackson though. 2019 and the Kawai is rebuilt, the LP, Jackson, G&L & Bugera gone..... It's been quite a shock to think of it like this! 10 years ago, my main guitar was conveniently my only guitar, as I started playing in late 2008. My trusty Yamaha F310 that my dad got me when he went out to buy new strings for me to play on his old, really low grade Musima acoustic. I think I'm starting to see progress. There's a healthy amount of irony to my comparison. I can't really claim to have had a main guitar in 2009 since I only had one guitar at the time and I wasn't playing it but I'll go with that one anyway. It was an Ibanez GIO GSA60 that I got it in 2007, and within a year I couldn't stand it. Today that doesn't surprise me, knowing how I play and what I like in a guitar. Nothing about it was or is compatible with that and at the time it got me to completely give up guitar for a good three years. I then spent some 9 years hating everything Superstrat or Strat-related. Every Strat I tried felt completely off, they looked stupid and I was never going to buy another one (after the Ibanez or even the second attempt with the Chapman ML-1, the only guitar I've ever sold). Then I found my Traditional '58 last summer. 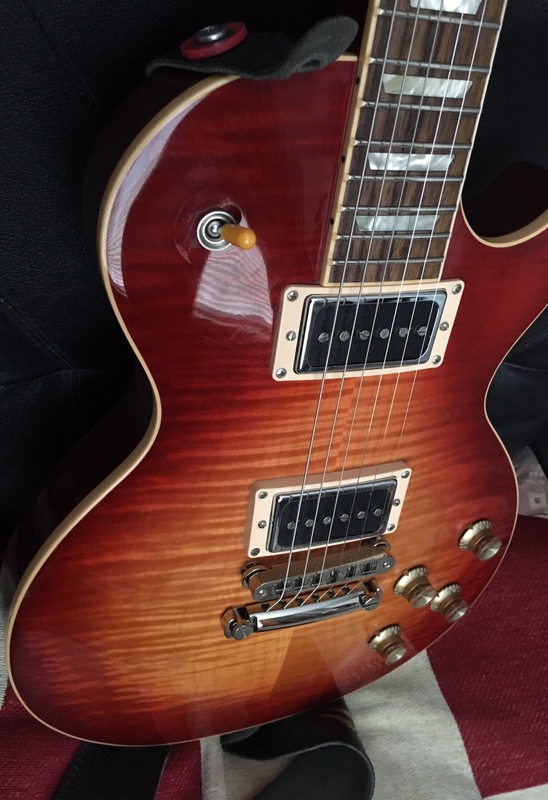 Every piece of spec from the neck profile and fretboard radius to the tuners and even the weird colour, was exactly how I would've had it if I ordered it custom (traditional woods, F-tuners, 7,25" radius U-neck and a weird or uncommon colour). Tried it and it felt perfect, but I decided to let it go since it was a Strat for a not insignificant amount of money at the time. Big mistake. I was traveling to family in another country right after this and spent the whole time thinking I had missed out on the perfect guitar, so much so that I didn't wait a day after I got home until I rushed to the store to see if it was still there so I could buy it. Since then I have barely played my other guitars and I'm still amazed at how perfect this one feels every single time I play it. So basically, over a span of 10 years I've gone from "I'll never buy another Strat, Superstrat or anything even vaguely reminiscent of a Strat" to have a Strat completely steal the spotlight in my small collection.... also... I still can't stand the Ibanez whenever I give it another chance. 10 years ago, barely played but had my Dean Customzone 100 in fluorescent pink (picture is a little bit older than 2009, but will fit the bill). 10 years later, actually bothered to learn how to play and after going through many different guitars and owning some more expensive ones, I always grab my Fender Mexican Stratocaster as my first choice, almost every time. My long-gone old bugger of a guitar, the Stellar Mercury 001 (LP copy, obviously). She was decent, but... lacking, in quite a few places (like where someone broke the headstock off, repaired it, but failed to make sure the truss rod worked properly... and it did not). Eventually gave up on trying to make it play better, and sold it to a shop. And from that shop, with a solid discount, I got this SG Special, which I modified, upgraded, beat up, fixed up, and generally screwed with until it played better and sounded alright. 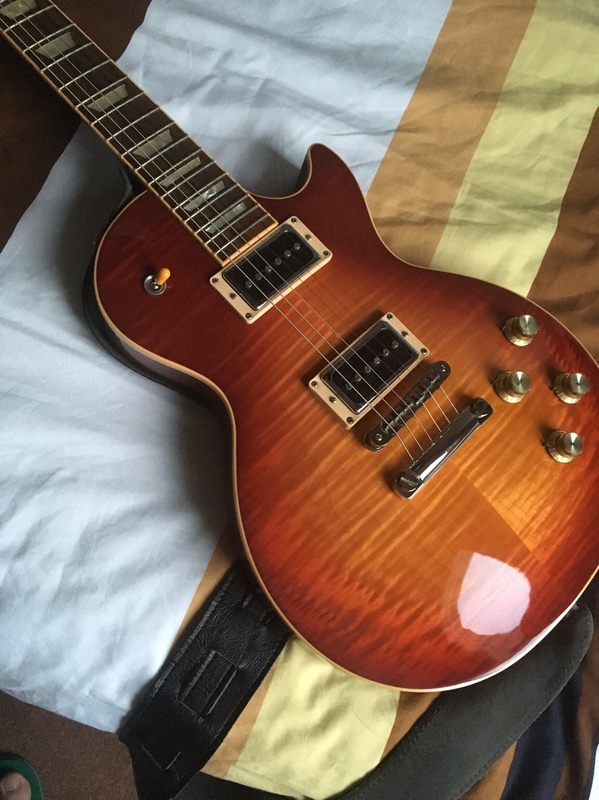 And then my dad got me this bugger, which was about as trashed as my old guitar, but that just gave me an excuse to beat it up and screw with EVEN MORE than the SG, so that was fun. 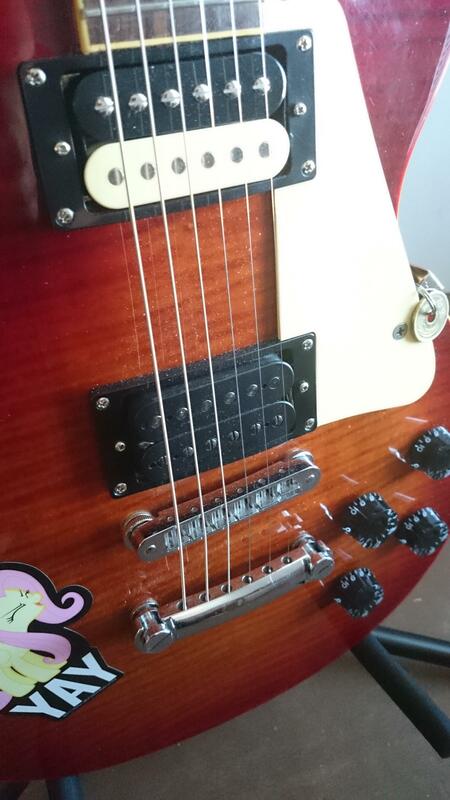 I slapped my Chapman's old bridge pickup in it, and a Push-pull pot for the volume control and coil tap, and that's all I needed, at the time. Later came the Spertzel locking tuners (same ones on my SG, too) and soon, I'll put in a new nut and string tree, then later (I hope) I'll have a new bridge, and at this point, probably a new neck, and then it won't be the same guitar at all, anymore! And despite all the issues with these 2 guitars, and despite having the Chapman ML-3 (which is a better guitar in every way, but weight, really), I play that SG and that cheap "Starcaster" Strat every week, at least 2-3 times a week, without fail. I always reach for the Strat when I'm inspired to play something in E Flat Standard, and the SG when I want to play Rocksmith or play something in E Standard (The ML-3 is in D Standard and D Drop C, where it stays, comfortably). They are my cheapest, crappiest, somehow still kinda awesome, go-to guitars. 10 years ago I had a ridiculous amount of guitars ... 20+ I think. But that orange MIJ Fender Stratocaster changed my view. I wanted to make 2 Warmoth Strats that would cover all I needed. So I sold all the guitars including the orange strat - except for my very first electric which is a Aria Pro II 335 knock off. I then build my two Warmoth guitars and settled down ... for at least a few months . But then I was hooked on making Warmoth guitars ... and I ended up with 10 builds ( and one more pending). So the blue flake (Discocaster) Warmoth is a swamp ash body with a Goncalo Alves neck with Pau Terror finger board. Hardtail TOM and 2 HS2 and a HS3 in bridge. Just a volume and Planet waves Auto Trim tuners. It really started out as a test of the pickups ... but man ... this guitar just sounds like I want to hear ... and it plays so well ... even when I play it! It is the top pick of 3-4 guitars that I use the most. Ten years ago, I didn't play regularly or at all well. 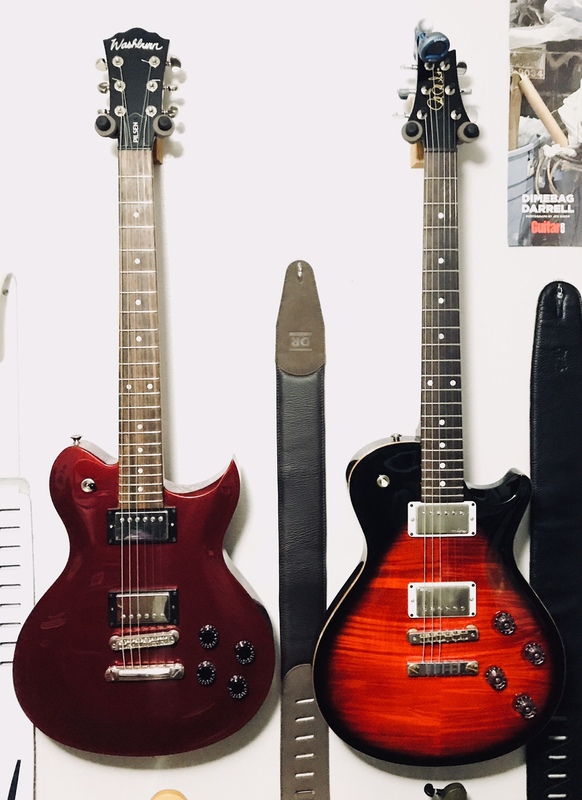 I still had three guitars, because I had a crappy Strat copy that I bought while I was at university, an acoustic and then at some point I bought the guitar on the left, a Lag Arkane. This was before I knew anything about guitars, and in particular before I knew that I disliked Floyd Rose trems! 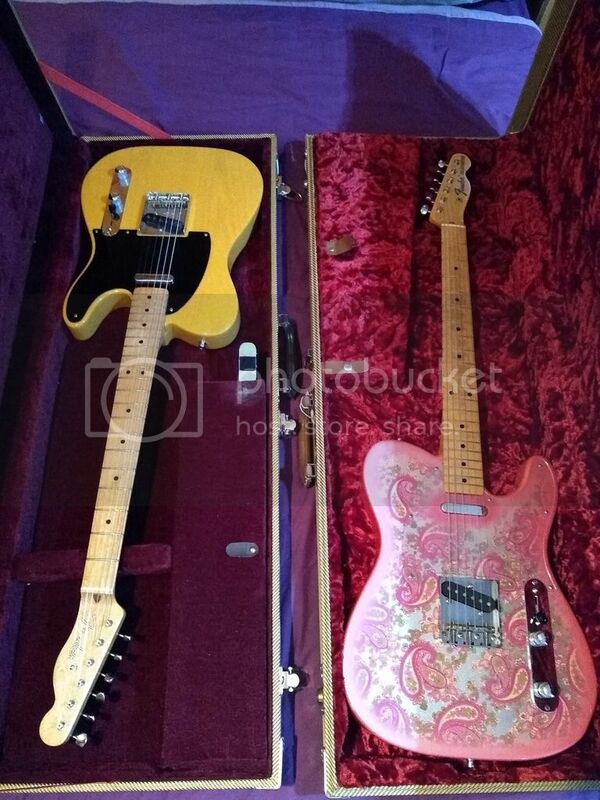 The guitar on the right may already be familiar to you, although you might have expected me to have picked one of the guitars that I've made. But no - I'm afraid that my own builds are not yet up to the level of a PRS Wood LIbrary Custom 24, and that's what I play most of the time. It's a great guitar to play, as well as being stunning to look at. That Washburn X50 Pro-Q was the first guitar that I bought with my own money and I loved it. I still don't know for the life of me why I sold it, even my dad says it was the stupidest decision of my life. Thanks to @Lonestar for the frankly fantastic work! Freshly modded with new pots (CTS volume Fender no-load tone) new orange drop caps for wah-like tone and treble bleed, Airline hum-sized singlecoil in the bridge and a mustang II Antiquity by Seymour Duncan in the neck, handled by a switchcraft slider for selections. I love this thing! It's like a guitar-y soulmate! 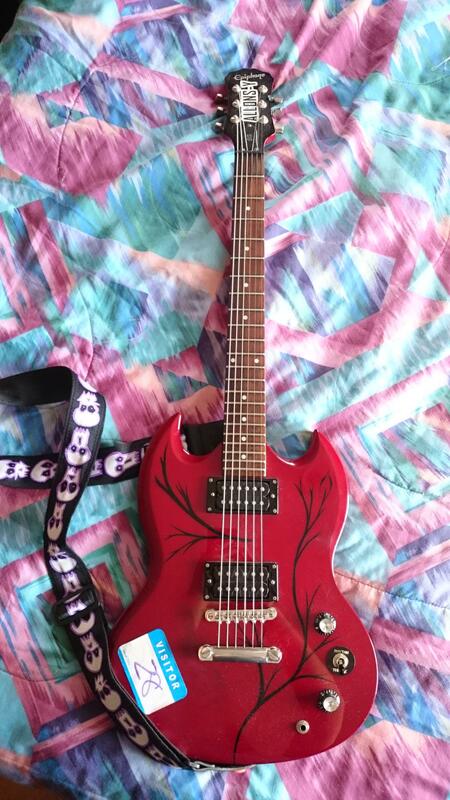 ...And then my dad got me this bugger, which was about as trashed as my old guitar, but that just gave me an excuse to beat it up and screw with EVEN MORE than the SG, so that was fun. I slapped my Chapman's old bridge pickup in it, and a Push-pull pot for the volume control and coil tap, and that's all I needed, at the time. Later came the Spertzel locking tuners (same ones on my SG, too) and soon, I'll put in a new nut and string tree, then later (I hope) I'll have a new bridge, and at this point, probably a new neck, and then it won't be the same guitar at all, anymore!